Most of the effort in switching away from gluten, in our culture, goes into replacing wheat. As I said last summer when I wrote about it, wheat has been the staff of life in Western Civilization for millennia… We “break bread” when we eat together, many of us thank God for “our daily bread” and praise Him because He “brings forth bread from the earth,” we even say “bread” or “dough” as slang for money. Bread is a very big deal. Barley? We see that mostly in barley malt – on cereal (the reason corn flakes, of all things, are not usually gf) and in beer. But I never did like cornflakes, and stopped drinking beer years ago… And, well, an occasional beef barley or mushroom barley soup. Now there I have a problem… See, I like both of them, and always did. I’d even found a source of hulless barley, so I could get actual fully whole grain barley (the pearled isn’t, quite, though it’s closer than most grains most of us eat, and would do for me in a pinch.) I routinely used barley in stew and soup, because it didn’t get mushy, like noodles or rice, it freezes well, unlike potatoes, and these are useful features if you want to make a large pot of something and freeze half of it for later… I’ve spent an entire winter making soup with no “brown” – jargon I use for a complex carbohydrate – actually in the soup. And I missed that option. But precisely the feature I didn’t like about it as a plain side dish – the very firm, separate, chewy grains – made me think it would work well in other contexts. A grain salad, for instance… (A friend makes a great cous cous salad, with the large Israeli cous cous. Maybe I’ll try her recipe, but with sorghum instead of cous cous.) Or as a substitute for barley… in salad, soup, or stew. I had a small piece of round, and decided to make a very small stew, as proof of concept. I also decided to make it quite plain, no real seasoning, so we would taste the sorghum and see how we liked it. You can certainly add your own preferred seasoning, or try adding sorghum to your own recipe – or go ahead and make this one, for something simple! 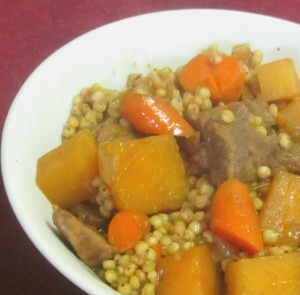 You can also reverse engineer, so to speak, and use hulless barley (sometimes called hulled barley, sometimes pot barley) exactly the way I used the sorghum, if you like and can eat that. Even if you can, though – I’m really finding it interesting to learn to use a wider variety of grains – I’m sorry I waited until it was forced on me! People tell me my diet is limited, but I’m finding it becoming much more varied. Then I chopped an onion, and sauteed it in my pan. When it was soft and golden, I removed it and reserved it. When I removed the onion from the pan, I raised the heat under it, and then put in the meat to sear it. I want some real browning happening on the meat itself, for the flavor. 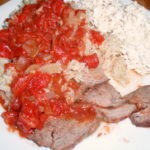 I don’t flour stew meat – I’ve tried doing it, and never found it made much difference… The big issue now is that so much meat is soaked in water, so when I heat it, liquid runs out, carrying the juices and flavor of the meat – and boiling it, rather than searing it… I pulled the pieces of meat up around the side of the pan to avoid that effect, and let the liquid boil off. (The other option, in my cast iron pan which is slightly raised in the middle, is to gather the meat in the raised center, and let the liquid drain off to the side…) Once the pan is dry, the meat starts really searing – that’s what you want. While that was going on, I cut up 2 carrots and half a large rutabaga, again into bite sized pieces. Once the meat had browned, I added the reserved onion, the cut up root vegetables, the sorghum in its water, and two cups of beef broth. (At this point you could add a bay leaf, for instance, or other herbs, or peppercorns, or… As I said, I chose to make this very plain.) I brought all that to a simmer, lowered the heat, and simmered it, very slowly, for an hour. At the end of the hour, everything was fully cooked. 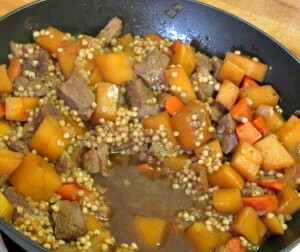 The sorghum was still a bit chewy, but pleasantly so… and it had absorbed flavor. The broth was still rather liquid – I like that, but if you don’t, you could stir in a roux cube… Barley sometimes thickens the broth, so it was interesting to see that the sorghum did not. It did, however, continue to absorb it. 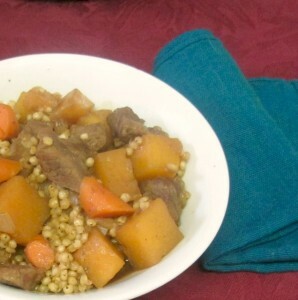 In the classic tradition of good homemade stew, it really was better the next day… The grain had absorbed all the broth, and was more tender, but still not at all either mushy or dry. The flavors had melded. 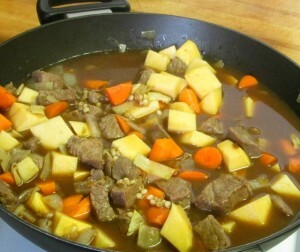 Since the whole point of using grain, rather than potatoes, was to have a stew that would stand up well to keeping, I was delighted by this… I will make a large pot of it, then package it in single serving sizes, and have them in the freezer as a meal to carry, or something to heat up when I don’t feel well. 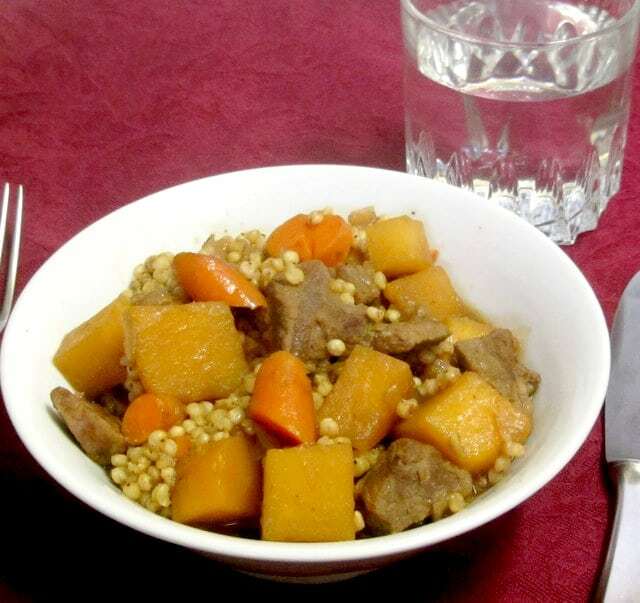 (I like chili, which is what I’ve been doing this with, but I really need a change…) I’m glad to have a gluten free beef stew recipe that steps into the beef barley stew spot, as it were. I didn’t try it, but I think that it would also work beautifully as soup. Add more broth, probably thicken it slightly, and I’d have a good Beef Barley Sorghum Soup… I thought I’d miss that, but here, I already found something to fit in that niche. Mushrooms will have to be next! 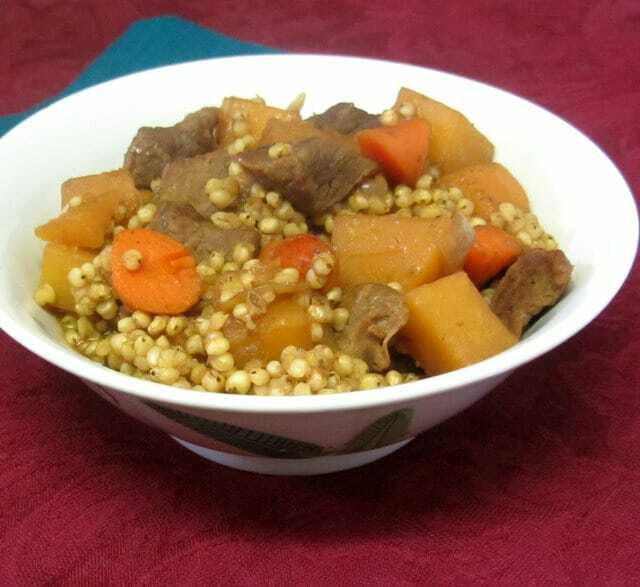 Use sorghum instead of barley to make a delicious gluten free beef stew that stores and reheats beautifully. Great for the freezer! Cook sorghum in 3 cups of water for half an hour. Saute onion, remove from pan and reserve. 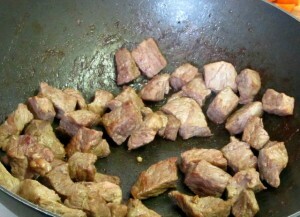 Cut meat into bite sized pieces for stew. Heat the pan you used for the onion over high heat, and sear the meat in it. When the meat is brown, return the onion to the pan, and add the vegetables, the broth, and the parboiled sorghum. Bring to a simmer, lower heat, and simmer for one hour.